The Spurs are the city's only team in any of the four major U.S. professional sports leagues and the only major-league team in the city's history to have lasted more than five years. Spurs players are active members of the San Antonio community, and many former Spurs are still active in San Antonio including David Robinson with the Carver Academy and George Gervin with the George Gervin Youth Center. The Spurs set several NBA attendance records while playing at the Alamodome including the largest crowd ever for an NBA Finals game in 1999, and the Spurs continue to sell out the smaller AT&T Center (formerly SBC Center) on a regular basis. Since 2003, the team has been forced on an extended road trip for much of February since the AT&T Center hosts the San Antonio Stock Show & Rodeo. This is informally known as the "Rodeo Road Trip". The Spurs have consistently posted winning road records during this period, including an NBA-record longest single road trip winning streak (eight games out of nine, achieved in 2003). When the Spurs have won the NBA title, the team's victory parades have been boat trips on the San Antonio River Walk. The San Antonio Spurs started out as the Dallas Chaparrals of the original version of the American Basketball Association (ABA). Coached by player/coach Cliff Hagan the Dallas Chaparrals were one of 11 teams to take the floor in the inaugural season of the upstart ABA. The Chaps' second season was a bit of a disappointment, as the team finished in 4th place with a mediocre 41–37 record. In the playoffs the Chaparrals quickly fell to the New Orleans Buccaneers. The team suffered from poor attendance and general disinterest in Dallas. In fact, during the 1970–71 season, the name "Dallas" was dropped in favor of "Texas" and an attempt was made to make the team a regional one, playing games in Fort Worth, at the Tarrant County Convention Center, as well as Lubbock, at the Lubbock Municipal Coliseum, but this proved a failure and the team returned full-time to Dallas in time for the 1971–72 season, splitting their games at Moody Coliseum and Dallas Convention Center Arena. While the Chaparrals had been modestly successful on the court, they were sinking financially by their third season, largely because the ownership group refused to spend much money on the team. After missing the playoffs for the first time in their existence in the 1972–73 season, nearly all of the owners wanted out. A group of 36 San Antonio businessmen, led by Manager/Angelo Drossos, Chairman of the Board/John Schaefer and President/Red McCombs, worked out a "lend-lease" deal with the Dallas ownership group. Drossos and his group would lease the team for three years and move it to San Antonio, and agreed to return the team to Dallas if no purchase occurred by 1975. After the deal was signed, the team was renamed the San Antonio Gunslingers. However, before they even played a game the name was changed to Spurs. The team's primary colors were changed from the red, white, and blue of the Chaparrals to the now familiar black, silver and white motif of the Spurs. In the first game at the HemisFair Arena the Spurs lost to the San Diego Conquistadors, despite attracting a noisy crowd of 6,000 fans. A smothering defense was the team's image, as they held opponents to less than 100 points for an ABA record of 49 times. The early Spurs were led by ABA veteran James Silas, and the team would get stronger as the season went on as they twice took advantage of the Virginia Squires, acquiring Swen Nater, who would go on to win Rookie of the Year, in November, and "The Iceman" George Gervin in January. The ABA tried to halt the Gervin deal, claiming it was detrimental to the league, but a judge would rule in the Spurs' favor, and Gervin made his Spurs debut on February 7. The Spurs would go on to finish with a 45–39 record, good for 3rd place in the Western Division. In the playoffs, the Spurs would battle the Indiana Pacers to the bitter end before falling in seven games. San Antonio embraced the Spurs with open arms; the Spurs drew 6,303 fans per game, surpassing the Chaparrals' entire total attendance in only 18 games. Schaefer, Drossos and McCombs knew a runaway hit when they saw it. After only one year, they exercised their option to tear up the lease agreement, buy the franchise outright and keep the team in San Antonio for good. The team quickly made themselves at home at HemisFair Arena, playing to increasingly large and raucous crowds. Despite a respectable 17–10 start during the 1974–75 season, Coach Tom Nissalke was fired as owners become tired of the Spurs' slow defensive style of games. He would be replaced by Bob Bass, who stated that the Spurs would have an entirely new playing style: "It is my belief that you cannot throw a set offense at another professional team for 48 minutes. You've got to let them play some schoolyard basketball." George Gervin and James Silas took that style to heart, as the Spurs became an exciting fast breaking team on the way to a solid 51–33 record, good enough for second place in the West. Gervin said, "Our whole theory was that you shoot 100 times, we'll shoot 107." However, in the playoffs the Spurs would fall to the Indiana Pacers in six games. Even though playoff success would elude the team, the Spurs had suddenly found themselves among the top teams in the ABA. Moreover, their gaudy attendance figures made them very attractive to the NBA, despite the size of the market. Although San Antonio had over 650,000 people at the time (and has since grown to become the seventh-largest city in the United States), it has always been a medium-sized market because the surrounding suburban and rural areas are not much larger than the city itself. In June 1976, the ABA–NBA merger took place, moving San Antonio's sole professional sports franchise into a new league. The Spurs, Denver Nuggets, Indiana Pacers and New York Nets moved to the NBA for the 1976–77 season. The Spurs and the other three ABA teams agreed to pay the owners of two other strong ABA teams that folded instead of joining the NBA. John Y. Brown, Jr., the owner of the Kentucky Colonels, received $3 million, which he used to purchase the NBA's Buffalo Braves and later the Boston Celtics, after selling star guard Louie Dampier to the Spurs. The owners of the Spirits of St. Louis received a portion of all television profits during their NBA tenure, which amounted to roughly 1/7 of the Spurs' television profit every year. This agreement placed particular financial pressure on the Spurs and the other three former ABA teams. In 2014, the Spirits' owners reached agreement with the NBA to end the perpetual payments and take a lump sum of $500 million instead. Although there was some initial skepticism in league circles regarding the potential success and talent levels of the incoming ABA teams, the Spurs would prove worthy of NBA inclusion during the 1976–77 season with a record of 44–38, good for a tie for fourth place overall in the Eastern Conference. This was done in spite of significant handicaps the NBA imposed on the incoming ABA teams, limiting their draft picks and television revenues during their early time in the merged league. They gained a new rival in the form of the Houston Rockets, who had played in Texas for five years prior to the merger. During the 1977–78 season, George Gervin and David Thompson of the Denver Nuggets battled all season for the NBA scoring title. On the final day of the season, Thompson took the lead by scoring 73 points in an afternoon game against the Detroit Pistons. That night Gervin knew that he needed 58 points against the Jazz in New Orleans. Gervin got off to a good start by scoring 20 points in the 1st quarter. In the 2nd, The Iceman was even better, setting a single period record with 33 points. Early on in the 3rd period Gervin scored his 58 points on the way to 63 capturing the scoring title. While Gervin was lighting up the scoreboard the Spurs were winning the Central Division with a 52–30 record. However, in the playoffs the Spurs would be stunned in six games by the Washington Bullets despite an outstanding series from Gervin who averaged 33.2 ppg. The following season in the 1979 Conference Finals the Spurs led the series 3–1 but the Bullets came back to win the last three games and came from behind to win the 7th game 107–105 handing the Spurs a heartbreaking loss. The Spurs would have to wait another 20 years to make it to their first NBA finals. The Spurs would go on to capture five division titles in their first seven years in the NBA and became a perennial playoff participant. However, in the playoffs, the Spurs would never find a break, losing to teams like the Washington Bullets, the Boston Celtics, the Houston Rockets, and the Los Angeles Lakers. As the 1980s progressed, the Spurs would see their shares of highs and lows. For the first few seasons of the decade, the Spurs continued their success of the 1970s with records of 52–30 in 1980–81, 48–34 in 1981–82, and 53–29 in 1982–83 (it was during this period that the Spurs were moved to the Western Conference). Despite their regular season success, the Spurs were unable to win any NBA championships, losing in the Western Conference playoffs to the Houston Rockets in the first round of the 1981 and the Los Angeles Lakers in four games 1982 and in six games in the 1983 Western Finals despite getting both wins at the Forum in the 1983 series. They lost every home game in both series in 1982 and 1983 vs the Lakers as Magic Johnson, Kareem Abdul-Jabbar and co. were too strong. The Spurs did not make the conference finals until 1995. After the 1984–85 season, Gervin, who had been the Spurs' biggest star, was traded to the Chicago Bulls in what effectively signaled the end of the era that began when the Spurs first moved to San Antonio. The next four seasons were a dark time in Spurs' history with the team having a combined record of 115–213 from 1985–86 until 1988–89. The losing seasons and dwindling attendance often caused the Spurs to be mentioned as a potential candidate for relocation to another city. The lone bright spot during this period was the Spurs being awarded the top pick in the 1987 NBA draft through NBA Draft Lottery. The Spurs used this selection on United States Naval Academy standout David Robinson. Although Robinson was drafted in 1987, the Spurs would have to wait until the 1989–90 season to see him in a Spurs uniform because of his prior two-year commitment to serve in the United States Navy. The Spurs seemingly bottomed out in 1988–89 with a record of 21–61, the worst in franchise history at the time. However, the 1989–90 season was notable for several reasons. It was the first season of full ownership for Red McCombs, who was an original investor in the team and helped solidify local ownership for the team. Additionally, the 1988–89 season featured the debut of Larry Brown as the Spurs head coach who moved to San Antonio after winning the NCAA National Championship with Kansas in 1988. Although there was speculation that Robinson might choose not to sign with the Spurs and to become a free agent once his Navy commitment ended, Robinson decided in the end to come to San Antonio for the 1989–90 season. While it was thought that Robinson's arrival would make the Spurs respectable again, no one expected what happened in his rookie season. Led by Robinson, 1989 draftee Sean Elliott from Arizona, and trade acquisition Terry Cummings from the Milwaukee Bucks, the Spurs achieved the biggest one-season turnaround in NBA history, finishing with a record of 56–26. They also jumped all the way to first place in the Midwest Division, their first division title in seven years. Robinson had one of the most successful rookie seasons for a center in NBA history, finishing the season as the unanimous Rookie of the Year while averaging 24.3 points and 12.0 rebounds. The Spurs began the 1990s with great optimism. The team became a perennial playoff presence, although unable to advance further than the second round of the NBA Playoffs under Brown's tutelage. Late in the 1991–92 season, McCombs fired Brown and replaced him with Bob Bass for the remainder of the season. Without a healthy David Robinson, the Spurs were swept out of the first round of the playoffs by the Phoenix Suns. McCombs made national headlines during the summer of 1992 with the hiring of former UNLV head coach Jerry Tarkanian. The Tarkanian experiment proved a flop, as the coach was fired 20 games into the 1992–93 season with the Spurs record at 9–11. After Rex Hughes filled the coaching shoes for one game, NBA veteran John Lucas was named head coach. It was Lucas' first NBA coaching assignment, although he had gained recognition in league circles for his success in helping NBA players rehab from drug abuse. The Lucas era started out successfully. His coaching propelled the team to a 39–22 finish over the rest of the regular season, and the team reached the Western Conference semi-finals. In 1993, local businessman Peter M. Holt and a group of 22 investors purchased the Spurs from Red McCombs for $75 million. In the 1993–94 season, the Spurs' first in the newly built Alamodome, Lucas led the team to a 55–27 record but the team suffered a loss in the first round of the playoffs, which led to the immediate firing of Lucas as head coach. Prior to the season the Spurs traded fan-favorite Elliott to the Detroit Pistons in return for rebounding star Dennis Rodman. Lucas was replaced by former Pacers coach Bob Hill for the 1994–95 season. Elliott returned to the team after an uneventful season with the Pistons, and the team finished with the NBA's best record at 62–20, cracking the 60-win mark for the first time in franchise history. Robinson was named the league's Most Valuable Player. The Spurs reached the Western Conference Finals, but lost to the eventual NBA Champion Houston Rockets. Throughout the season, and particularly in the playoffs, there appeared to be friction developing between Rodman and several Spurs' teammates, most notably Robinson. Rodman was traded to the Chicago Bulls after the season, and helped the Bulls win three titles from 1996 to 1998. The Spurs finished the 1995–96 season under Hill at 59–23 and lost in the Western Conference semi-finals. Few observers could have predicted how far the Spurs would fall during the 1996–97 season, especially with the signing of Dominique Wilkins. Robinson missed the first month of the season due to a back injury. He returned in December, but played only six games before a broken foot sidelined him for the rest of the season. Elliott also missed more than half the season due to injury. Without Robinson and Elliott, the Spurs were a rudderless team. The lone bright spot was Wilkins, leading the team in scoring with an average of 18.2 ppg. The Spurs ended the season with a 20–62 record, the worst in franchise history—and to date, the last time they have missed the playoffs. Hill only lasted 18 games as coach that season, eventually being fired and replaced by general manager Gregg Popovich, who had also served a stint under Brown as an assistant coach. Wilkins would play his lone season in 1996–97 for San Antonio, knowing his minutes and playing time would greatly diminish next season. As disastrous as the 1996–97 season was for the Spurs, the off-season proved to be the opposite. With the third-worst record in the league, the Spurs won the NBA's draft lottery, which gave them the top pick in the 1997 draft. The Spurs used their pick to select Wake Forest product and consensus All-American Tim Duncan. Gregg Popovich watched Tim Duncan play in summer league and immediately noted that, "If I try to coach this guy, the only thing I can do is screw him up", effectively saying that Duncan was very gifted, very intelligent, and had a keen knowledge of the game. Duncan quickly emerged as a dominant force in the NBA during the 1997–98 season, averaging 21.1 points and 11.9 rebounds per game as a power forward. He was named First Team All-NBA while winning Rookie of the Year honors. The team ended up at 56–26, breaking their own record from 1989–90 for the biggest single-season improvement for wins, but once again lost to the Jazz in the Western Conference semi-finals. While both Duncan and Robinson played low-post roles, the two seamlessly meshed on the court. With a healthy Robinson and Duncan and the additions of playoff veterans such as Mario Elie and Jerome Kersey, the Spurs looked forward to the 1998–99 season. Prior to the beginning of training camps, however, the NBA owners, led by commissioner David Stern, locked out the players in order to force a new collective bargaining agreement with the National Basketball Players Association (NBPA). The season was delayed for over three months until resolution on a new labor agreement was reached in January 1999. Playing a shortened 50-game season, the Spurs earned an NBA-best 37–13 record (.740 win percentage, and only season since Duncan was drafted the Spurs did not win at least 50 games in a season as of 2016). The team was just as dominant in the playoffs, rolling through the Western Conference with a record of 11–1. In the NBA Finals, they faced the New York Knicks, who had made history by becoming the first eighth seed to ever make the NBA Finals. The Spurs won the series and the franchise's first NBA Championship in Game 5 at the Knicks' home arena, Madison Square Garden. Duncan was named the NBA Finals MVP. The Spurs became the first former ABA team to reach and to win the NBA Finals. They also won the 1999 McDonald's Championship in the off-season and were the last champions of that tournament as it was disbanded right after. Coming off their first NBA Championship, the Spurs were still among the best teams in the West and battling for first place in the Midwest Division during the 1999–2000 season. On March 14, the Spurs playoff spirits got a lift when Sean Elliott, who received a kidney transplant from his brother prior to the season, returned and played in the last 19 games. As the season wound down, Duncan suffered a knee injury and the Spurs finished in second place with a 53–29 record. Without Duncan, the Spurs were knocked out of the playoffs by the Phoenix Suns in four games. The long-term viability of the Spurs franchise in San Antonio was, however, achieved during the 1999–2000 season, as Bexar County voters approved increases in car rental and hotel taxes which would allow for the construction of a new arena next to the Freeman Coliseum. The Spurs finished with 58–24 records for both the 2000–01 and 2001–02 seasons but found themselves suffering playoff ousters in both seasons from the eventual NBA Champion Los Angeles Lakers, getting swept from the 2001 Conference Finals and losing in five games during the second round in 2002. 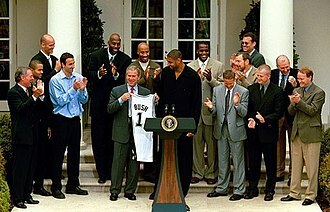 The Spurs visit the White House after their championship in 2003. Entering the 2002–03 season, the team knew it would be memorable for at least two reasons, as David Robinson announced that it would be his last in the NBA and the Spurs would begin play at their new arena, the SBC Center, named after telecommunications giant SBC, whose corporate headquarters were located in San Antonio (SBC became AT&T after its acquisition of its former parent company). To mark this occasion, the Spurs revamped their "Fiesta Colors" logo and reverted to the familiar silver and black motif (though, during the time of the Fiesta logo, the uniform remained silver and black). This version of the Spurs was very different from the team that had won the title a few years earlier. Second-year French star Tony Parker, drafted by the Spurs in the first round of the 2001 NBA draft, was now the starting point guard for the Spurs. The squad featured a variety of newly acquired three-point shooters, including Stephen Jackson, Danny Ferry, Bruce Bowen, Steve Kerr, Steve Smith and Argentine product Manu Ginóbili, a 1999 second-round draft choice playing in his first NBA season. The Spurs christened the SBC Center in style on November 1, 2002 by defeating the Toronto Raptors 91–72. The Spurs would not get off to a flying start as they had just a 19–13 record heading into January. In January the Spurs began to gel and seemed prepped to make a run, when they embarked on their annual Rodeo Road Trip, a nine-game road trip from January 25 to February 16. However, it would be hardly a bump in the road for the charging Spurs, who won eight of the nine and began to climb their way to first place. The Spurs went on to erase their seven-game deficit and finished the season in a tie with the Dallas Mavericks for the best record in the NBA (60–22). Thanks to a tiebreaker, the Spurs won their third straight Division title as Tim Duncan claimed his second straight NBA MVP. In the playoffs, the Spurs defeated the Suns, Lakers and Mavericks en route to facing the New Jersey Nets in the NBA Finals. The series against the Nets marked the first time two former ABA teams played each other for the NBA Championship. The Spurs won the series 4–2, giving them their second NBA Championship in franchise history. Duncan, after having been named NBA MVP, was also named Finals MVP. Coming off their second NBA Championship, the retirement of David Robinson left a void in San Antonio's daunting defense, while playoff hero Steve Kerr and veteran forward Danny Ferry also retired. Meanwhile, backup point guard Speedy Claxton was left for the Warriors, and Stephen Jackson left for Atlanta. With several holes to fill in their rotation, the Spurs would make several key signings in the off-season. Rasho Nesterovic and Hedo Türkoğlu were brought in to replace Robinson and Jackson, respectively. What proved to be the most important off-season acquisition would be the signing of veteran Robert Horry. The Spurs, playing with nine new players, struggled early as they missed the presence of Robinson while the new players struggled to fit in, as they held a 9–10 record on December 3. However, the Spurs would turn it around, as they ended December on a 13-game winning streak and quickly climbed back to the top of the NBA standings. They would battle all year for the top spot in the Western Conference, as they ended the season on another strong note winning their final 11 games. However, they would fall one game short of a division title and the best record in the West, posting a record of 57–25. In the second round of the playoffs, the Spurs found themselves in another showdown with the Los Angeles Lakers. The Spurs would win Games 1 and 2 at home, but drop the next two in the Los Angeles. In Game 5 back in San Antonio, Duncan seemingly delivered the Spurs a 73–72 win as he hit a dramatic shot with just 0.4 seconds remaining. However, the Lakers' Derek Fisher would launch a game-winner as time expired, giving the Lakers a stunning 74–73 win to take a 3–2 series lead. The Spurs would eventually lose the series in six games. After their disappointing second round collapse, the Spurs looked to regain the NBA crown. With the acquisition of guard Brent Barry from Seattle, the Spurs would get off to a quick start, posting a 12–3 record in November. The Spurs would stay hot through December as they established a 25–6 record entering the New Year. With the later additions of center Nazr Mohammed from New York (acquired in a midseason trade of Malik Rose), and veteran forward Glenn Robinson from free agency, alongside regulars Bruce Bowen, Robert Horry, Tony Parker, Manu Ginóbili, and Tim Duncan, the Spurs would be near the top in the Western Conference all season, battling the Phoenix Suns for the best record in the NBA. Just as it appeared the Spurs would cruise toward the playoffs their season suddenly hit a bump in the road when Tim Duncan suffered an ankle injury. The Spurs struggled the rest of the season, finishing just 59–23. However, by the time the playoffs rolled around, Duncan was ready to return. In the postseason, The Spurs went through the West relatively easily, culminating with a 5-game victory in the Conference Finals over the Phoenix Suns. In the NBA Finals, the Spurs would face the defending champion Detroit Pistons. The first two games in San Antonio were both Spurs victories as Ginóbili led the way with 26 and 27 points, in blow out wins by the Spurs. However, as the series shifted to Detroit, the Spurs were the ones who were blown out, losing Games 3 and 4 by big margins as the Pistons evened the series. Faced with a third straight loss in Detroit, the Spurs would play tougher in Game 5, which would go into overtime. After going scoreless in the first half, Robert Horry hit a clutch three-point shot with nine seconds remaining to give the Spurs a dramatic 96–95 win. The series moved back to San Antonio for game six, but the Spurs were unable to close out the series, setting up a deciding Game 7. In Game 7, Duncan had 25 points as the Spurs pulled away late to win their third NBA Title in seven years with an 81–74 win. Duncan was named Finals MVP, becoming the fourth player to win the MVP award three times (joining Magic Johnson, Shaquille O'Neal, and Michael Jordan). Coming off their third NBA Championship in seven years, there was a sense that the Spurs were the class of the NBA, and once again would be the team to beat in the NBA for the Championship. For the 2005–06 season, the Spurs acquired the two-time All-Star Michael Finley and one-time All Star Nick Van Exel. Not surprisingly, the Spurs would come flying out of the gate, winning 16 of their first 19 games. Once again, the Spurs would get challenged within their own division by the Dallas Mavericks as they held the two best records in the Western Conference all season, battling for first place. In the end, the experience of the Spurs would be the difference as they won the Southwest Division again with a new franchise best record of 63–19. The Spurs met the Mavericks in the second round of the playoffs, but it would be Dallas coming out on top 4–3, including a 119–111 overtime victory in Game 7. The Spurs struggled during the first half of the 2006–07 season, which led to discussions of trading away veteran players to build for the future. The team remained intact, and the Spurs would win 13 games in a row during February and March, and were an NBA-best 25–6 in the final 31 games, as the Spurs were able to claim the 3-seed in the West. The Spurs cruised through the first round, while the #1-seeded Dallas Mavericks were upset. This set up a second-round series with the Phoenix Suns as the key series in the entire NBA Playoffs, as this series featured the teams with the two best records remaining in the NBA. The Spurs went on to win 4–2 in the contentious and controversial series versus the Suns. The series featured a Robert Horry foul on Steve Nash toward the end of Game 4 which resulted in Horry being suspended for two games. Those who said the second-round series against the Suns was the true NBA Finals would be proven right, as the Spurs easily dispatched the Utah Jazz in five games to reach the NBA Finals. In the Finals, the Spurs swept the Cleveland Cavaliers and captured their fourth title in nine years. Tony Parker, who dominated in the Finals averaging 24.5 ppg on 57% shooting, was named Finals MVP and became the first European-born player to win the award. The 2007–2008 season saw the Spurs go 56–26 and finish 3rd in the Western Conference. The Spurs faced hurdles but would make it to the Western Conference Finals, but lose to the Lakers in five games. The next season would see the Spurs drop off in wins to 54–28 and lose to the Dallas Mavericks in the first round of the playoffs. Two days before the 2009 NBA draft, general manager R. C. Buford acted to address the team's age and health concerns by acquiring 29-year-old swingman Richard Jefferson from the Milwaukee Bucks. The Spurs sent 38-year-old Bruce Bowen, 36-year-old Kurt Thomas, and 34-year-old Fabricio Oberto to the Bucks, who swapped Oberto to the Detroit Pistons for Amir Johnson. The Spurs held three 2nd-round picks in the 2009 draft. Their selection of Pittsburgh Panthers forward DeJuan Blair with the #37 pick was described as a "steal" by analysts; the Spurs later drafted two guards they had been targeting with the No. 37 pick, taking Miami Hurricanes shooting guard Jack McClinton and point/shooting guard Nando de Colo from France with the No. 51 and No. 53 picks, respectively. On July 10, 2009, the Spurs signed Detroit Pistons power forward Antonio McDyess to a three-year deal worth approximately $15 million in guaranteed money. The Spurs struggled with injuries during the 2009–10 regular season, but managed another 50-win season, finishing at 50–32. The seventh-seeded Spurs would once again battle the Mavericks in the first round of the playoffs. After falling to the Mavericks in Game 1, the Spurs went on to avenge their 2009 defeat to Dallas by winning the series in six games. The Spurs however, were swept out of the playoffs in the following round by the Phoenix Suns. During the 2010 NBA draft, the Spurs management held the highest draft pick since the Tim Duncan draft a decade earlier. They drafted rookie James Anderson from Oklahoma State at #20. However, Anderson was soon sitting out of the first half of the season due to injuries. In 2010–11, the Spurs finished 61–21 to be the #1 seed, but an injury to Ginóbili in the final regular season game took a toll on the team, and they were upset by the #8 seeded Memphis Grizzlies. 2011 brought a change to the Spurs' philosophy that set the stage for the next successful run in the club's history. Out went the stream of last-legs, wizened veterans that the Spurs had relied on to fill out the rotation behind the Big Three. Minutes went to younger and more athletic talent like Danny Green, Gary Neal, and Tiago Splitter, to whom Popovich would teach The Spurs' Way – a fast pace, unselfish passing, and accountability on defense. The biggest personnel move of the Spurs' off-season had the team sending guard George Hill to his hometown Indiana Pacers for San Diego State's Kawhi Leonard, a hyper-athletic forward selected #15 overall by the Pacers in the 2011 NBA draft. The team also selected Texas Longhorns' Cory Joseph as the #29 overall pick. After the lockout that delayed the 2011–2012 season, the Spurs signed T.J. Ford, who would eventually retire in the middle of the season after playing only 14 games due to a stinger. Before the trade deadline, the Spurs decided to part ways with Richard Jefferson and sent him to the Golden State Warriors for Stephen Jackson, who had been a member of the 2003 championship team. Leonard then became the starting small forward. In the week following the trade deadline, the Spurs also signed forward Boris Diaw after his contract was bought out by the Charlotte Bobcats, and former Portland Trail Blazers guard Patrick Mills who played for the Xinjiang Flying Tigers in the CBA during the lockout. This gave the Spurs a deeper bench for their playoff run. Kawhi Leonard was acquired by the Spurs in 2011. Despite the shortened 66-game NBA season due to the NBA lockout, the Spurs won 50 games and tied the Chicago Bulls for the best record in the league. They extended their streak of 50+ win seasons to 13 since the 1999–2000 season, an NBA record. Popovich won his second Coach of the Year. The Spurs swept the first two rounds of the Playoffs. With those two sweeps, a 10-game win streak to end the season, and wins in Games 1 and 2 of the Western Conference Finals, the Spurs would win 20 straight games. However, the Oklahoma City Thunder would end up winning the next four games in the West Finals, to take the series 4–2. During the 2012 off-season, the Spurs re-signed swingman Danny Green, who was a welcome surprise for them from the previous season, and Tim Duncan, both for three years. The Spurs would have a strong 2012–13 season, going 58–24 and earning the #2 seed in the West. The Spurs clinched the playoffs for a 16th consecutive season, as well as extended the NBA record with 50+ games for 14 consecutive seasons. On April 16, the Spurs signed two-time scoring champion, and seven-time All-Star Tracy McGrady to help in the playoffs after waiving Stephen Jackson. The Spurs finished the regular season second in the Western Conference behind the Oklahoma City Thunder with a record of 58–24, and swept the Los Angeles Lakers in the first round, 4–0. In the second round of the 2013 playoffs, the Spurs faced Stephen Curry and the Golden State Warriors. They beat the Warriors four games to two. In the conference finals, the Spurs swept the Memphis Grizzlies, with Tony Parker having an 18-assist performance in Game 2 and a 37-point performance in Game 4. The Spurs would meet the defending champion Miami Heat in the NBA Finals. The Spurs and Heat would alternate wins the first six games in the series. In Game 6, the Spurs were on the verge of winning their fifth NBA title. San Antonio was up five points with 28 seconds to go in regulation. An unlikely and uncharacteristic series of mishaps would doom the Spurs down the stretch, including the benching of Duncan by Popovich at the end of regulation with the Spurs on defense. The Heat missed their field goal attempt, but the undersized Spurs could not grab the defensive rebound. Chris Bosh rebounded the ball and Ray Allen then hit a 3-pointer to tie the game with five seconds left in regulation to send it to overtime, during which the Spurs were defeated 103–100. In Game 7, San Antonio jumped out to a lead early and kept the game close the entire way. Toward the end of the game, however, and despite a 24-point, 12 rebound effort, Duncan failed to convert on two attempts to tie the game: a missed layup and missed tip-in that allowed LeBron James to hit a jumper and increase the Heat's lead to 92–88. After a steal from Ginóbili, James hit two free throws after being fouled by Duncan, and when Ginóbili missed a subsequent 3-pointer, Dwyane Wade hit one out of two from the free throw line to put the game on ice, as the Heat would win their second straight championship. The Spurs returned with their core roster largely intact, adding free agents Marco Belinelli and Jeff Ayres (formerly Jeff Pendergraph) while losing Gary Neal to the Milwaukee Bucks. The Spurs clinched the best record in the NBA with 62 wins, which included a franchise record 19 straight wins in February and March. In the first round of the playoffs, the eighth-seeded Dallas Mavericks surprised the Spurs by taking the series to 7 games, but the Spurs prevailed in convincing fashion in the deciding Game 7. In the second round, Tim Duncan surpassed Karl Malone for fifth place in NBA Playoffs all-time points scored while the Spurs cruised past the Portland Trail Blazers in 5 games. San Antonio played the Oklahoma City Thunder in the Western Conference Finals, which marked the third straight appearance in the Western Conference Finals for the Spurs, and defeated them in 6 games to advance to the Finals for a second straight year for a rematch with the Miami Heat. It was also the first time that they had advanced to the Finals in consecutive years. This made it the first time since 1998 NBA Finals that the same two teams faced off in the Finals in consecutive years. With a victory in the second game of the series, Duncan, Ginóbili, and Parker won more playoff games together than any other three players on the same team in NBA history. The Spurs would go on to win the 2014 NBA Championship, 4 games to 1. The Spurs blew out Miami in all of their wins, each of them by 15 or more points. Kawhi Leonard had a breakout performance and was named NBA Finals MVP for his big game performance and is the third youngest to win it, behind Magic Johnson and teammate Duncan. In the 2014 NBA draft, they selected Kyle Anderson out of UCLA as the 30th overall pick. During the 2014 off-season, the Spurs made headlines when they announced that they had hired Becky Hammon as an assistant coach, effective with her retirement as a player at the end of the 2014 WNBA season. Hammon became the first full-time female coach in any of the four major U.S. professional leagues. The 2014–15 season was an up-and-down season, but finishing strong with a 55–27 regular season record and 6th seed in the West, they qualified for the playoffs. They faced the Los Angeles Clippers in the first round of the playoffs. The Spurs went up 3–2 heading into Game 6 at San Antonio. However, the Clippers would win that game and go on to win Game 7 at home. The San Antonio Spurs became the first defending champions since the 2011–12 Dallas Mavericks to be eliminated in the first round of the NBA playoffs. With the acquisitions of four-time All-Star power forward LaMarcus Aldridge and veteran big man David West during the off-season, the Spurs finished the 2016–17 season with a 67–15 record, earning them the Southwest Division title. They also set a franchise record for most wins in a season with 67 and a NBA record for most home wins in a season with 40 (tying the 1985–86 Boston Celtics 40–1 home record). The Spurs also had the league's best defense. During the playoffs they swept the shorthanded Memphis Grizzles in the first round before losing to the Oklahoma City Thunder in 6 games in the second round. They would become the first team since the 2006–07 Dallas Mavericks to finish with 67 wins and be eliminated before the conference finals. On July 11, 2016, Duncan announced his retirement from the NBA after 19 seasons with the Spurs. He became one of two players in NBA history to record at least 26,000 points, 15,000 rebounds and 3,000 blocks in his career (along with Kareem Abdul-Jabbar) while also being the only NBA player to reach 1,000 wins with a single team. In the 2016–17 season, despite the retirement of longtime captain Tim Duncan, the Spurs—led by Kawhi Leonard—remained a title contender and finished with a record of 61–21. After defeating the Grizzlies and the Rockets in the first two rounds of the playoffs, the Spurs—who suffered injuries to Leonard, Parker, and David Lee—were swept by the Golden State Warriors in the Western Conference Finals. In the third quarter of Game 1 of the 2017 Western Conference Finals, Leonard landed on Zaza Pachulia's foot after attempting a field goal and re-aggravated an existing ankle injury; he sat out the remainder of the series. In the following off-season, the Spurs re-signed Aldridge, Pau Gasol and Patty Mills and signed Rudy Gay, but lost Dewayne Dedmon and Jonathon Simmons to free agency. The Spurs' 2017–18 season was overshadowed by an injury to star Kawhi Leonard and reports of ensuing disputes between Leonard and the Spurs regarding the handling of that injury. Leonard missed the first 27 games of the 2017–18 season with a right quadriceps injury. In January 2018, after a brief comeback, he was ruled out for an indefinite period of time to continue his rehabilitation process from right quadriceps tendinopathy. Leonard was subsequently cleared to play by the Spurs medical staff, but he solicited a second opinion from his own doctors. In March, the Spurs held a players-only meeting in which Leonard's teammates reportedly asked him to return to the court; the meeting was described as "tense and emotional". Leonard did not play again in 2018. On April 3, 2018, the Los Angeles Clippers defeated the Spurs 113–110, handing San Antonio its 33rd loss of the season. This loss ended the Spurs' record streak of eighteen 50-win seasons that had stretched back to 2000, including the 2011–12 season, which was shortened by a lockout (the Spurs finished 50–16). The Spurs eventually finished the season with a record of 47–35 and were defeated 4–1 by the Warriors in the first round of the playoffs. Following the season, LaMarcus Aldridge was named to the All-NBA Second Team and point guard Dejounte Murray was named to the NBA All-Defensive Second Team. In June 2018, following months of reports of growing tension between Leonard's camp and the Spurs stemming from a disagreement over his injury rehabilitation process, reports indicated that Leonard had requested a trade. On July 18, 2018, Leonard and Danny Green were traded to the Toronto Raptors in exchange for DeMar DeRozan, Jakob Pöltl and a protected 2019 first-round draft pick. On July 6, 2018, Tony Parker signed with the Charlotte Hornets after having played his entire 17-year career with the Spurs. On August 27, Manu Ginóbili announced his retirement after a 16-year career with the Spurs in the NBA. The Spurs finished the 2018-19 season with a 48-34 record and the seventh seed in the Western Conference; they are scheduled to face the Denver Nuggets in the first round of the playoffs. The team qualified for the playoffs for the 22nd consecutive playoff season. Starting in 1999, the Spurs and Lakers combined to win seven straight Western Conference titles. From 1999 to 2004, the rivalry rivalry between the Spurs and the Los Angeles Lakers was considered the NBA's best, as each time the clubs faced each other in the playoffs, the winner advanced to the NBA Finals. The rivalry between the San Antonio Spurs and the Dallas Mavericks features two teams with Dallas roots. The Spurs began their life in the ABA as the Dallas Chaparrals and did not move to San Antonio until 1973. The Mavericks were swept in the 2012–13 season by the Spurs for the first time since the 1998 season, Tim Duncan's rookie season. In their last matchup of the season, San Antonio escaped with a 95–94 victory over Dallas when a Vince Carter attempt bounced off the rim at the buzzer. With that win, the Spurs clinched a playoff spot for a 16th straight season. San Antonio also reached 50 wins for a 14th consecutive season, the longest streak in NBA history. The rivalry between the Spurs and the Houston Rockets was renewed in the 2017 playoffs, in which the two teams met in the Western Conference Semifinals. The match-up was the first between the two teams in the playoffs since the 1995 Western Conference Finals. Five of the six games in the series resulted in blowouts. In Game Two of the series, starting point guard Tony Parker suffered a ruptured quadriceps tendon, forcing him to miss the remainder of the playoffs. In Game Five, all-star small forward Kawhi Leonard suffered an injury to his right ankle in the third quarter, resulting in him sitting out for the closing portions of the game. Despite the injury issues, the Spurs were able to send Game Five to overtime. In the overtime period, Manu Ginóbili blocked James Harden's three-point attempt in the final seconds to secure the 110–107 victory for the Spurs. The Spurs would close out the series in a Game Six blowout, 114–75. The San Antonio Spurs' previous wordmark logo. Since becoming the San Antonio Spurs in 1973, the team colors have been black, silver and white. The distinctive logo of the word Spurs in Eurostile font, with the stylized spur substituting for the letter U, has been a part of the team's identity since their move to San Antonio. The logo incorporated 'Fiesta colors' of pink, orange and teal, used from 1989 to 2002 (though the uniforms remained the same), and alignment from straight to arched beginning with the 2002–03 NBA season. The Spurs have always worn black on the road and white at home, except during the 1973–76 ABA seasons and their first NBA season when the home uniform was always silver. Until the 1988–89 NBA season, the road uniform had "San Antonio" on the front while the home uniform featured the team nickname adopted from the Spurs logo; from 1973 to 1982, the road uniform lettering was black with silver trim. In addition, from 1977 to 1981 a saddle-like striping was featured on the back of the home shorts. Since the 1989–90 NBA season the Spurs uniform has remained practically the same, with the road uniform now using the team nickname from their logo; a minor change included the addition of another black (road) and white (home) trim to the already silver-trimmed block numbers in the 2002–03 season. The Spurs wear black sneakers and socks on the road, and white sneakers and socks at home (except for select games with the silver alternates), a practice that began in the 2002–03 season. When the NBA moved to the Adidas Revolution 30 technology for the 2010–11 season, the Spurs changed to V-neck jerseys and eliminated striping on the shorts' beltline. On September 19, 2012, the Spurs unveiled a silver alternate uniform. In breaking from the traditional practice of placing the team or city name in front, the Spurs' new uniform features only the stylized spur logo, with the black number trimmed in white and silver on the upper right. The Spurs primary logo is atop the player name and number on the back (replaced by the NBA logo prior to the 2014–15 season), while the Eurostile 'SA' initials (for San Antonio) are on the left leg of the shorts. Black, silver and white side stripes are also featured on the uniform. The uniforms are worn for select home games. A variation of this uniform, featuring military camouflage patterns instead of the usual silver, was used for two games in the 2013–14 season; a sleeved version was used the next season. Another variation, this time in black, was unveiled for the 2015–16 season. At times throughout the season, the Spurs wear a jersey that says "Los Spurs" on the front, in recognition of Latino fans both at home and across the US and Latin America. The Spurs were one of the first NBA teams to wear these branded jerseys. In 2014, the jerseys were sleeved. These events are called "Noches Latinas", first launched during the 2006–07 NBA season, part of an Hispanic marketing campaign known as "éne-bé-a". Six teams in the NBA participate in these events. The Spurs have had the most players from Latin America and are one of only three NBA teams who have had at least five players on their rosters who originate from Latin America and Spain (if one includes Puerto Rico as part of Latin America, although it is a U.S. territory), the others being the Memphis Grizzlies and the Portland Trail Blazers. The switch to Nike as the uniform provider in 2017 eliminated the "home" and "away" uniform designations. The Spurs' black "Icon", silver "Statement" and white "Association" uniform remained identical to the previous set save for the manufacturer's logo and updated lettering on the team name. The Coyote showing a sign to the crowd during a time-out at a Spurs game. The Coyote has been the Spurs' mascot since 1983. Created by and portrayed for 21 years by Tim Derk, Coyote is known for his slapstick humor, rehearsed skits and previous dance numbers with Spurs' cheerleaders, the Silver Dancers, who were replaced in 2018 after 26 years. The Coyote was a 2007 inductee into the Mascot Hall of Fame and has been featured in local and national media. List of the last five seasons completed by the Spurs. For the full season-by-season history, see List of San Antonio Spurs seasons. The Spurs own the NBA rights to the players listed in the table below. The typical pattern is to allow the player to develop in leagues outside the United States. The player is free to negotiate contracts in other leagues and is not obligated to play in the NBA. Sometimes, a player's overseas contract may have an expensive buyout clause that would discourage the Spurs from seeking to bring him in. The Spurs have had past success in finding foreign talent; some examples of this success include the selections of second rounder Manu Ginóbili (57th overall in 1999) and first rounder Tony Parker (28th overall in 2001), who both went on to become All-Stars. 1 On July 9, 2015, the Spurs "unretired" and reissued the number 12 to LaMarcus Aldridge with the blessing of Bruce Bowen. 1 He also coached the team in 1967–1970. 2 In total, Robinson was inducted into the Hall of Fame twice – as player and as a member of the 1992 Olympic team. 1 During the 1979–80 season, Doug Moe coached 66 regular season games. Moe was fired on March 1, 1980, and Bob Bass coached the remaining 16 regular season games as well as the playoffs. 2 During the 1983–84 season, Morris McHone coached 31 regular season games. McHone was fired on December 28, 1983, and Bob Bass coached the remaining 51 regular season games. 3 During the 1991–92 season, Larry Brown coached 38 regular season games. Brown was fired on January 21, 1992, and Bob Bass coached the remaining 44 regular season games as well as the playoffs. 4 During the 1992–93 season, Jerry Tarkanian coached 20 regular season games. Tarkanian was fired on December 18, 1992. Rex Hughes then coached one regular season game, and John Lucas coached the remaining 61 regular season games as well as the playoffs. 5 During the 1996–97 season, Bob Hill coached 18 regular season games. Hill was fired on December 10, 1996, and Gregg Popovich coached the remaining 64 regular season games. ^ "Spurs Won-Loss Record By Year" (PDF). San Antonio Spurs 2017–2018 Media Guide. NBA Properties, Inc. October 14, 2017. Retrieved April 5, 2018. ^ "NBA.com/Stats–San Antonio Spurs seasons". National Basketball Association. Retrieved January 29, 2017. ^ "SAN ANTONIO SPURS CONTINUE CLASSIC LOOK WITH 2017-18 NIKE JERSEYS". Spurs.com. NBA Media Ventures, LLC. August 11, 2017. Retrieved April 5, 2018. The San Antonio Spurs unveiled today the Nike Association Edition and Icon Edition uniforms that will be worn by the Silver and Black during the 2017-18 NBA season. ^ "San Antonio Spurs Reproduction and Usage Guideline Sheet". NBA Properties, Inc. Retrieved November 17, 2017. ^ "Frost Bank First-Ever Jersey Partner of the San Antonio Spurs". Spurs.com (Press release). NBA Media Ventures, LLC. August 22, 2018. Retrieved August 22, 2018. ^ "Peter J. Holt And Corinna Holt Richter to succeed Julianna Hawn Holt And Peter M. Holt on Spurs Sports & Entertainment Board of Managers". NBA.com. March 29, 2019. Retrieved April 9, 2019. ^ Marquez, R. J. (March 29, 2019). "Peter J. Holt appointed Spurs chairman and co-CEO, succeeds mother in role". KSAT. Retrieved April 9, 2019. ^ Monroe, Mike (August 2, 2014). "Ex-ABA players, Spurs settle suit". San Antonio Express-News. Retrieved April 8, 2019. ^ Mendoza, Madalyn (June 25, 2018). "On this day in San Antonio history: The Spurs won their first NBA Championship 19 years ago". San Antonio Express-News. Retrieved April 8, 2019. ^ a b Berri, David (October 4, 2018). "Can Gregg Popovich Continue The Greatest Run In NBA History?". Forbes. Retrieved April 8, 2019. ^ "San Antonio Spurs officially become 'best' franchise in NBA history". FOX Sports. March 3, 2015. Retrieved April 8, 2019. ^ Quinn, Chris (April 5, 2019). "The complete history of the Spurs in the NBA Playoffs". San Antonio Express-News. Retrieved April 8, 2019. ^ Devine, Dan (April 4, 2018). "The San Antonio Spurs' near-two-decade streak of 50-win seasons is over". sports.yahoo.com. Retrieved April 8, 2019. ^ Feldman, Dan (March 31, 2019). "Spurs match record by making playoffs 22nd straight year". NBC Sports. Retrieved April 4, 2019. ^ McDonald, Jeff (March 30, 2014). "In San Antonio, success is spelled S-P-U-R-S". expressnews.com. Retrieved April 8, 2019. ^ "History". Carver Academy. September 17, 2001. Archived from the original on July 28, 2011. Retrieved January 27, 2013. ^ "George Gervin Youth Center". Iceman44.org. December 12, 2012. Retrieved January 27, 2013. ^ www.spursportal.com. "San Antonio Spurs News, Schedule, Players, Scores, Stats, history... @ Spursportal". Spursportal.com. Retrieved January 27, 2013. ^ "2002–03 San Antonio Spurs". Basketball-Reference.com. Retrieved June 30, 2015. ^ "Spurs parade for 4th NBA champion title". Chinadaily.com.cn. Retrieved January 27, 2013. ^ "Dallas Chaparrals (1967–1973)". Sportsecyclopedia.com. October 6, 2005. Retrieved January 26, 2012. ^ "Dallas Chaparrals History". Remembertheaba.com. January 5, 1971. Retrieved May 21, 2009. ^ "San Antonio Spurs page". Remembertheaba.com. Retrieved May 21, 2009. ^ "Behind The Name – Spurs". National Basketball Association. July 21, 2015. Retrieved July 21, 2015. ^ "Spurs ABA History". Remembertheaba.com. Retrieved May 21, 2009. ^ Darren Rovell. Spirit of ABA deal lives on for Silna brothers. ESPN.com, January 22, 2001. ^ Dave Anderson. SPORTS OF THE TIMES; THE ROBINSON PLOT THICKENS, The New York Times, May 18, 1987. ^ "Archived copy". Archived from the original on July 8, 2011. Retrieved May 19, 2009. CS1 maint: Archived copy as title (link), databasebasketball.com, accessed May 19, 2008. ^ a b c d , sportsecyclopedia.com, April 23, 2009, accessed May 13, 2008. ^ "Parker perplexed once again", San Antonio Express-News, May 14, 2004. ^ "S.A. is heartbreak city", San Antonio Express-News, May 14, 2004. ^ Fisher's Jumper Gives Lakers Dramatic Game 5 Win, NBA.com, May 13, 2004. Retrieved February 7, 2007. ^ , sports.yahoo.com, June 20, 2005, accessed May 20, 2008. ^ Lee, Michael (June 15, 2007). "For Spurs, a Familiar Ring". The Washington Post. pp. E01. Retrieved July 17, 2009. ^ Ford, Chad (June 24, 2009). "San Antonio Spurs get Richard Jefferson from Milwaukee Bucks for 3 players – ESPN". ESPN. Retrieved July 11, 2009. ^ Arnovitz, Kevin (July 9, 2009). "The Back of the (Really Large Manila) Envelope Guide to the Las Vegas Summer League – TrueHoop By Henry Abbott – ESPN". ESPN. Retrieved July 11, 2009. ^ "Spurs fans are going to enjoy watching Blair work under the boards". Nba.com. July 12, 2009. ^ McDonald, Jeff (June 25, 2009). "Spurs see Blair as steal". Mysanantonio.com. Archived from the original on June 29, 2009. Retrieved July 11, 2009. ^ Monroe, Mike (July 11, 2009). "Spurs' low-key tactics land McDyess". Mysanantonio.com. Retrieved July 16, 2009. ^ "Spurs Sign 2010 Draft Pick James Anderson | THE OFFICIAL SITE OF THE SAN ANTONIO SPURS". Nba.com. Retrieved January 27, 2013. ^ "Spurs Sign Tracy McGrady". NBA.com. Turner Sports Interactive, Inc. April 16, 2013. Retrieved May 27, 2013. ^ "Spurs at Warriors". NBA.com. Retrieved June 30, 2015. ^ "Spurs at Grizzlies". NBA.com. Retrieved June 30, 2015. ^ "Spurs at Heat". NBA.com. Retrieved June 30, 2015. ^ "Becky Hammon hired to Spurs' staff". ESPN.com. Associated Press. August 5, 2014. Retrieved August 5, 2014. ^ Fagan, Kate (August 5, 2014). "Becky Hammon was born to coach". ESPNW.com. Retrieved August 5, 2014. ^ Nathan, Alec. "Spurs Tie All-Time NBA Record for Most Home Wins in a Regular Season". Bleacher Report. Retrieved May 13, 2016. ^ Schuhmann, John. "Spurs playing good defense". NBA. Retrieved December 11, 2015. ^ Casciaro, Joseph. "Spurs join 2007 Mavs to win 67 games and be eliminated before the conference finals". thescore.com. Retrieved May 13, 2016. ^ Carter, Dylan (May 24, 2017). "San Antonio Spurs: A Year in Review". Retrieved June 25, 2018. ^ Dominguez, Raul (May 22, 2017). "Warriors sweep Spurs, becoming the first team in history to start playoffs 12-0". Retrieved June 25, 2018. ^ "Kawhi Leonard 2016-17 Game Log". Basketball-Reference.com. Retrieved May 22, 2017. ^ "Barea, Mavs spoil Leonard's return with 95-89 win over Spurs". ESPN.com. December 12, 2017. Retrieved December 12, 2017. ^ "KAWHI LEONARD UPDATE". NBA.com. January 17, 2018. Retrieved January 17, 2018. ^ McDonald, Jeff (February 22, 2018). "Leonard cleared medically but still in pain". San Antonio Express-News. Archived from the original on April 16, 2018. ^ Chiari, Mike (March 22, 2018). "Report: Spurs Held 'Emotional' Players-Only Meeting Asking Kawhi Leonard to Play". Bleacher Report. Retrieved May 6, 2018. ^ Barnewall, Chris; Maloney, Jack (April 15, 2018). "Kawhi Leonard injury updates: Spurs star will miss entire 2018 NBA playoffs, report says". CBS Sports. Retrieved May 6, 2018. ^ "LAMARCUS ALDRIDGE NAMED TO ALL-NBA SECOND TEAM". San Antonio Spurs. Retrieved December 15, 2018. ^ "DEJOUNTE MURRAY NAMED TO NBA ALL-DEFENSIVE SECOND TEAM". San Antonio Spurs. Retrieved December 15, 2018. ^ "Reports: Kawhi Leonard demands trade from San Antonio Spurs". NBA.com. June 15, 2018. Retrieved July 18, 2018. ^ "Kawhi Leonard trade: Spurs send unhappy star to Raptors for DeMar DeRozan in multiplayer deal". CBSSports.com. Retrieved December 15, 2018. ^ "Tony Parker leaving San Antonio Spurs, going to Charlotte Hornets". Nbcsports.com. July 6, 2018. Retrieved December 15, 2018. ^ Schad, Matt (August 27, 2018). "Manu Ginobili announces retirement". NBA.com. Retrieved August 27, 2018. ^ Houston Rockets vs. San Antonio Spurs All-Time Head-to-Head Record in the NBA. Land of Basketball.com. Retrieved on August 2, 2017. ^ 2017 NBA Western Conference Semifinals: Rockets vs. Spurs Basketball Reference. Retrieved on August 2, 2017. ^ Spurs' Tony Parker has ruptured quadriceps tendon. ESPN: May 5, 2017. Retrieved on August 2, 2017. ^ Manu Ginóbili Blocks Harden to Give Spurs OT Victory and Series Lead. The New York Times: May 10, 2017. Retrieved on August 2, 2017. ^ a b "Going Retro: San Antonio Spurs". National Basketball Association. July 4, 2015. Retrieved July 4, 2015. ^ "San Antonio Spurs Primary Logo (1976/77-1988/89)". SportsLogos.net. July 4, 2015. Retrieved July 4, 2015. ^ "San Antonio Spurs Unveil New Alternate Jersey". San Antonio Spurs. September 19, 2012. Retrieved July 21, 2015. ^ "Spurs Unveil New Military-Inspired Uniforms". San Antonio Spurs. October 24, 2013. Retrieved July 21, 2015. ^ "San Antonio Unveils Black Signature Spur Jerseys". San Antonio Spurs. October 15, 2015. Retrieved October 16, 2015. ^ "NBA.com". NBA.com. Retrieved June 30, 2015. ^ "NBA.com: All-Time List of NBA Latino Players". NBA.com. Archived from the original on May 6, 2015. Retrieved June 30, 2015. ^ "SAN ANTONIO SPURS CONTINUE CLASSIC LOOK WITH 2017-18 NIKE JERSEYS". San Antonio Spurs. August 11, 2017. Retrieved September 2, 2017. ^ Derk. "Tim Derk Takes On A New Role". San Antonio Spurs. Retrieved 8 March 2019. ^ "An abrupt firing leaves San Antonio Spurs dance team hurt and suspicious". San Antonio Spurs. Retrieved 12 April 2019. ^ "mascothalloffame.com: Hall of Famers". archive.is. 28 January 2013. Retrieved 8 March 2019. ^ Dubinski, Marilyn (February 4, 2019). "A history of wildlife at the AT&T Center". Pounding The Rock. Retrieved April 8, 2019. ^ a b "Spurs select Nikola Milutinov and Cady Lalanne in NBA Draft". NBA.com. June 25, 2015. Retrieved June 25, 2015. ^ "SAN ANTONIO TRADES BORIS DIAW TO UTAH". NBA.com. July 8, 2016. Retrieved September 24, 2016. ^ "SAN ANTONIO SELECTS KYLE ANDERSON IN 2014 NBA DRAFT ACQUIRE RIGHTS TO NEMANJA DANGUBIC FROM 76ERS". NBA.com. June 26, 2014. Retrieved October 2, 2014. ^ "Spurs Select Joseph And Hanga in 2011 NBA Draft". NBA.com. June 23, 2011. Retrieved October 2, 2014. ^ "Spurs Trade Tiago Splitter To Atlanta Hawks". NBA.com. July 9, 2015. Retrieved July 9, 2015. ^ "Spurs Obtain Draft Rights To Kawhi Leonard". NBA.com. June 23, 2011. Retrieved October 2, 2014. ^ "Trades Between San Antonio Spurs and Atlanta Hawks". NBA.com. October 2, 2014. Retrieved October 2, 2014. ^ "NBA Draft: Howard goes first". onlineathens.com/. June 25, 2004. Retrieved October 2, 2014. ^ "With Bowen's blessing, Spurs to give No. 12 to Aldridge". MySA. July 9, 2015. Retrieved July 9, 2015. ^ a b "San Antonio Spurs: Players". Basketball Reference. Retrieved April 18, 2016. All facts and records taken from the San Antonio Spurs' history section. The 1999 NBA Finals was the championship round of the shortened 1998–99 NBA season or the 1999 season. The Western Conference champion San Antonio Spurs took on the Eastern Conference champion New York Knicks for the title, with the Spurs holding home court advantage. The series was played under a best-of-seven format, with the first team to collect four game victories winning the series. The Spurs defeated the Knicks 4 games to 1 to win the championship. As of 2018, this is the last NBA Finals where neither team scored 100 or more points in any game during the series. Will Lyman narrated the season-ending documentary Go Spurs Go! for NBA Entertainment. The 2003 NBA playoffs was the postseason tournament of the National Basketball Association's 2002–03 season. The tournament concluded with the Western Conference champion San Antonio Spurs defeating the Eastern Conference champion New Jersey Nets, 4 games to 2, in the NBA Finals. Tim Duncan was named NBA Finals MVP for the second time. This postseason featured the most series decided by 6 games in NBA Playoff history. This postseason is notable for being the first time that all series were conducted in a best-of-seven format. It was also the only time in playoff history that no team was swept in a first-round series. From 1984 to 2002, the first-round series were best-of-five. This is the first time that the NBA Playoffs carried more games on cable television than regular broadcast television, and marks the debut for the NBA Playoffs to be aired on NBA TV, and the return broadcast on ESPN and ABC after the NBA departed from NBC and TBS. The Detroit Pistons advanced to the Eastern Conference Finals for the first time since the Isiah Thomas and Joe Dumars-led team was swept by the Chicago Bulls in 1991, ending the Pistons' quest for a third consecutive title. The Pistons would go on to appear in six consecutive Eastern Conference Finals through 2008, the most consecutive appearances for any Eastern Conference team since the Bill Russell-led Boston Celtics (1956–69). The Dallas Mavericks ended a long conference finals drought by making it there for the first time since 1988. As of 2018, the 49-win Nets are the most recent NBA Finals participant to win fewer than 50 games in an 82-game season. The Boston Celtics were swept in a postseason series for the first time since 1983. The 2007 NBA playoffs was the postseason tournament of the National Basketball Association's 2006–07 season. The tournament concluded with the Western Conference champion San Antonio Spurs defeating the Eastern Conference champion Cleveland Cavaliers 4 games to 0 in the NBA Finals. Tony Parker was named NBA Finals MVP, making him the first Spur other than Tim Duncan and the first European-born player to receive the award. The 2019 NBA playoffs is the postseason tournament of the National Basketball Association's 2018–19 season. The playoffs began on April 13 and will end with the NBA Finals, which are expected to start on May 30. Gregg Charles Popovich (born January 28, 1949) is an American professional basketball coach. He is the head coach and President of the San Antonio Spurs of the National Basketball Association (NBA). Taking over as coach of the Spurs in 1996, Popovich is the longest tenured active coach in both the NBA and all major sports leagues in the United States. He is often called "Coach Pop" or simply "Pop. "Popovich has the most wins in NBA history (regular season and playoffs), surpassing Lenny Wilkens and Don Nelson on April 13, 2019. He has led the Spurs to a winning record in each of his 22 full seasons as head coach, surpassing Phil Jackson for the most consecutive winning seasons in NBA history, as well as a winning record against every other NBA team. He has also led the Spurs to all five of their NBA titles, and is one of only five coaches in NBA history to win five titles—the others being Jackson, Red Auerbach, Pat Riley, and John Kundla. The San Antonio Spurs are an American professional basketball team based in San Antonio, Texas. They are a member of the Southwest Division of the Western Conference in the National Basketball Association (NBA). The franchise was founded as the Dallas Chaparrals of the American Basketball Association (ABA) in 1967. The team suffered from poor attendance and general disinterest by fans in Dallas, and the name "Dallas" was dropped in favor of "Texas" during the 1970–71 season in an attempt to make the team regional. This also proved to be a failure, and the team returned full-time to use "Dallas" for the 1971–72 season. The team was put up for sale after missing the playoffs in the 1972–73 season. The team was acquired by a group of 36 San Antonio businessmen, led by Angelo Drossos and Red McCombs, who relocated the team to San Antonio, Texas and renamed it to Spurs. In 1976, the ABA folded, threatening the future of San Antonio's sole professional sports franchise. The NBA, however, decided to admit four ABA teams into the league, including the Spurs, along with the Denver Nuggets, the Indiana Pacers and the New York Nets.There have been 18 head coaches for the San Antonio Spurs. The franchise won their first NBA championship in the 1999 NBA Finals coached by Gregg Popovich. The Spurs won four additional NBA championships in 2003 NBA Finals, 2005 NBA Finals, 2007 NBA Finals and 2014 NBA Finals under Popovich. Popovich is the franchise's all-time leader in both regular season and playoff games coached and wins. He also won the NBA Coach of the Year award for 2002–03 season. Larry Brown is the only member of the franchise that has been inducted into the Basketball Hall of Fame as a coach. Bob Bass, who has coached with the Spurs for four terms, leads the franchise in most number of terms coached. Cliff Hagan, Max Williams, Bill Blakeley, Dave Brown, Morris McHone, Jerry Tarkanian and Popovich spent their entire coaching careers with the Spurs. The San Antonio Spurs are a professional basketball team based in San Antonio that competes in the National Basketball Association (NBA). In 1967, the franchise was founded in Dallas, Texas as the Dallas Chaparrals--one of the eleven charter franchises of the American Basketball Association (ABA). During the 1970–71 season, in an attempt to make the team a regional one, the franchise renamed itself the Texas Chaparrals; also, some home games were played in Fort Worth and Lubbock. However, low attendance figures prompted the team to return full-time to Dallas the following season. In 1973, the franchise relocated to San Antonio and was renamed the San Antonio Spurs. Three years later, the Spurs were one of four ABA franchises that joined the NBA as a result of the ABA–NBA merger. In 42 seasons since joining the NBA, the Spurs have achieved a winning record 36 times, have appeared in the NBA playoffs 38 times, and have won five NBA Championships. The team won its most recent NBA championship 2014. The only NBA franchises that have won more championships than the Spurs are the Boston Celtics (17 championships), the Los Angeles Lakers (16), the Golden State Warriors (6), and the Chicago Bulls (6).As of the end of the 2017-2018 season, the Spurs owned the NBA's all-time best win percentage; the team had won 62.2% percent of its games since joining the NBA, placing it ahead of the Minneapolis/Los Angeles Lakers (.591), the Boston Celtics (.590), the Seattle SuperSonics/Oklahoma City Thunder (.540), and the Utah Jazz (.538). The Midwest Division was a division in the Western Conference of the National Basketball Association (NBA). The division was created at the start of the 1970–71 season, when the league expanded from 14 to 17 teams with the addition of the Buffalo Braves, the Cleveland Cavaliers and the Portland Trail Blazers. The league realigned itself into two conferences, the Western Conference and the Eastern Conference, with two divisions each in each conference. The Midwest Division began with four inaugural members, the Chicago Bulls, the Detroit Pistons, the Milwaukee Bucks and the Phoenix Suns. The Bulls and the Suns joined from the Western Division, while the Pistons and the Bucks joined from the Eastern Division. The division was disbanded when the league expanded from 29 to 30 teams with the addition of the Charlotte Bobcats at the start of the 2004–05 season. The league realigned itself into two conferences with three divisions each. The Midwest Division was replaced with two new divisions, the Southwest Division and the Northwest Division. The 2003–04 season, the division's last-ever season, consisted of seven teams, the Dallas Mavericks, the Denver Nuggets, the Houston Rockets, the Memphis Grizzlies, the Minnesota Timberwolves, the San Antonio Spurs and the Utah Jazz. The Mavericks, the Rockets, the Grizzlies and the Spurs joined the Southwest Division, while the Nuggets, the Timberwolves and the Jazz joined the Northwest Division.The Denver Nuggets played 28 seasons in the Midwest Division, longer than any other team. Three teams, the Heat, the Magic and the Charlotte Hornets, only played one season each in the division. None of the four inaugural members remained when the division was disbanded in 2004. Despite the name, the division was made up mostly of teams who were located far outside the Midwest from 1980 to 2004. Michael Vincent Budenholzer (born August 6, 1969) is an American professional basketball coach who is the head coach of the Milwaukee Bucks of the National Basketball Association (NBA). Before joining the Bucks, Budenholzer spent five seasons as head coach of the Atlanta Hawks and 18 seasons with the San Antonio Spurs, serving as a video coordinator for the first two seasons and then as an assistant coach under head coach Gregg Popovich. The Rockets–Spurs rivalry is an NBA rivalry between the Houston Rockets and the San Antonio Spurs. It is also known as the I-10 Rivalry since San Antonio and Houston lie on Interstate 10, it is one of the three National Basketball Association rivalries between teams from Texas, the others featuring Houston and San Antonio versus the Dallas Mavericks.